Miss Allegiance, starring George Takei, Lea Salonga and Telly Leung, when it shuttered on Broadway earlier this year after 113 regular performances? Never fear, the production was filmed and will be presented by Fathom Events at movie theaters nationwide for one night only on December 13 at 7:30PM local time. The event will begin with an exclusive introduction from Takei and immediately move into the musical’s presentation. Audiences will also be treated to special behind-the-scenes footage and interviews with the cast and creators. Directed by Stafford Arima and based on Takei’s childhood experience in a Japanese-American interment camp, Allegiance features music and lyrics by Jay Kuo and a book by Marc Acito. 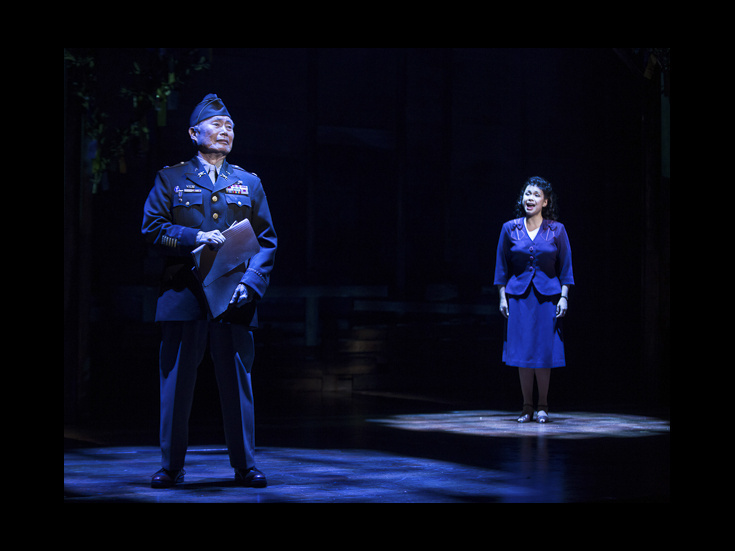 A story of family, love and patriotism set during World War II and beyond, the show follows veteran Sam Otsuka and his sister Kei as they find themselves torn between loyalty to their family and allegiance to their country. The cast also included Katie Rose Clarke, Michael K. Lee, Christopheren Nomura and Greg Watanabe. George Takei makes his Broadway debut in this new musical.